Dana Rohrabacher can't escape dinosaur farts. The Republican congressman, whose Southern California district is a prime Democratic target this November, has suggested that methane emitted by the prehistoric creatures contributed to climate change. "We don't know what those other cycles were caused by in the past," he said in 2007 about global warming. "Could be dinosaur flatulence, you know, or who knows?" 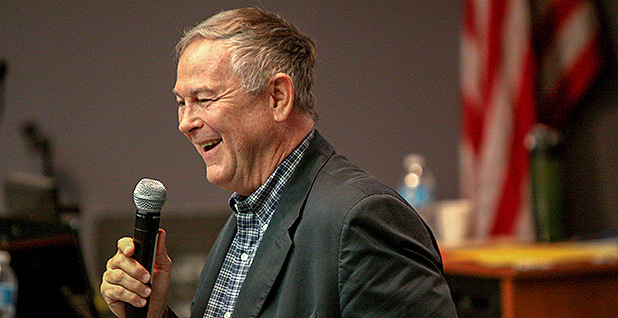 Rohrabacher, a vocal critic of mainstream climate science, says the line was a joke. "I was making fun of that whole position," he said in a recent interview with E&E News in his Washington, D.C., office. "Does it back up my argument to say that we're recognizing that dinosaur flatulence caused the climate change? No! My argument is it doesn't." But he hasn't been able to shake the quote, and now it's hounding him in his race to hold on to his seat this fall. His opponent, real estate executive Harley Rouda, highlighted the dinosaur comments in a campaign ad earlier this year, where "Seinfeld" actor Jason Alexander played a debate moderator asking both candidates about their climate change views. The response from Rouda, who's hoping environmental issues will help oust his opponent: "The only dinosaurs around Orange County are in theme parks. Ninety-seven percent of scientists know climate change is being driven by our overuse of fossil fuels." Rouda is one obstacle that could block Rohrabacher from getting what he wants next year: the gavel of the House Science, Space and Technology Committee. The others: House Democrats and House Republicans. The panel's current chairman, Texas Republican Rep. Lamar Smith, is retiring at the end of this year. If Democrats win the chamber, they'll name the next chairman. But Rohrabacher isn't a shoo-in for the job even if he wins his race and Republicans can hold the House. Rohrabacher is outranked by Rep. Frank Lucas (R-Okla.), who's currently the vice chairman. Lucas, also a senior member of the House Financial Services Committee, where Chairman Jeb Hensarling (R-Texas) is retiring, has been in talks with the Republican Steering Committee about his prospects, according to Lucas' spokeswoman, Meg Wagner. "Science is definitely something he's looking into," she said. Seniority isn't the only factor when Republicans pick a committee chairman; relationships with leadership and other GOP lawmakers are big factors, too. But Rohrabacher is hopeful. "I'm running for re-election based on the idea that I've got a good shot at getting this," he said of the Science gavel. Rohrabacher, 71, is an avid surfer with a fierce independent streak. He was a speechwriter in the Reagan White House before he joined Congress in 1989. Lately, he's been under scrutiny for his ties with Russia. He acknowledges that he's ruffled feathers within his party. He voted against the Republican's landmark tax overhaul last year and calls himself "the point person on legalizing marijuana in the United States." Those positions and others might complicate his bid to get a gavel. "I'm not someone who just toes the line of what the Republican Party is all about," he said. "I'm a freethinker, and they don't want that; they want people who are a little bit willing to just take orders." House Majority Leader Kevin McCarthy (R-Calif.) is expected to vie to become speaker of the House after Paul Ryan's (R-Wis.) retirement if Republicans maintain power in the House. "I've never worked under Kevin as speaker," Rohrabacher said, noting that he may prefer someone willing to take orders. "I'm hoping he decides he wants to have a California guy in there." 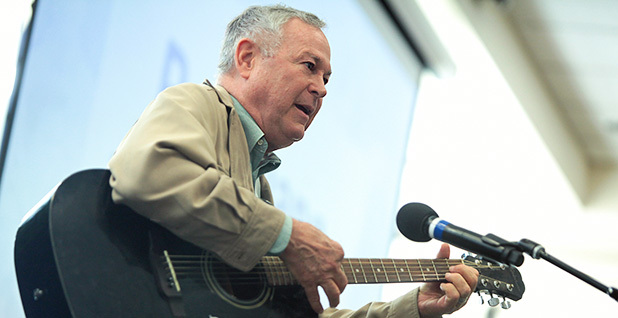 If he does become chairman, Rohrabacher promises more debates over climate science. "We need to have the best experts and most articulate experts on both sides of an issue and give them their chance to make their case and to debate each other," he said. "I would be fair to everybody, not only be fair to everybody because that's my nature, but also because I'm inquisitive, I want to hear all the arguments." Rohrabacher says that although he's "well-known as a skeptic of the global warming theory of man-made CO2," he does think humans play a part in climate change. "Human beings have an impact on everything. It's a minor impact compared to the sun, for example. The sun has a major impact, and sunspots and positioning the Earth to the sun has enormous impact, where mankind's contribution is minimal. CO2, for example, I think, is really minimal. Man-made CO2, and of course man-made CO2 is a very small fraction of the CO2 that's in the air." There's a popular argument among climate change skeptics that solar radiation, rather than humans' greenhouse gas emissions, is driving global warming. But leading climate scientists have said solar radiation is not a significant contributor to current climate change. It's hard for Rohrabacher to believe people who argue that man-made greenhouse gases are changing the planet's climate, he said, in part because "they lie about things I've said so often, for example ... dinosaur flatulence." "It's so sinister that they have made that bogus description of what my position is. ... These are steely-eyed fanatics, and they couldn't see the humor in trying to make that suggestion. And obviously, they're the ones who think dinosaur flatulence eliminated the dinosaurs, not me." Rohrabacher criticized some advocates of curbing greenhouse gas emissions for wanting to "outlaw pets — dogs. There's been a couple of studies suggesting that." A 2017 study from UCLA, for example, found that the food consumed by U.S. cats and dogs created the equivalent of 64 million tons of carbon dioxide per year — roughly the same impact as driving by 13.6 million cars. If he takes the Science gavel, he'd like to look into those kinds of climate studies. "We're going to make sure that money is not being wasted — I mean, who paid for this damn investigation and research into whether or not people should own dogs, and would that have an impact on the climate? I want to make sure that the money that's being spent is actually pushing the envelope of understanding." Rohrabacher doesn't own a dog, but he did have one when he was a kid — a Boston terrier. "The irony to me is they're saying I'm anti-global warming, when the fact is I am anti-exaggerating the role that mankind plays. But I am fully aware that mankind does play a role and we should make it a positive role. And we could do that by coming up with technology that will make energy more efficient and cleaner. And I'm in favor of that. But I'm not in favor of draconian taxes and regulations telling people they can't own a dog, for Pete's sake." On the energy front, Rohrabacher wants to push the United States "to build the first working prototype of the next generation of nuclear power," he said. "That's my No. 1 priority, and I believe that if I can become the chairman, within at least a two-year, perhaps four-year period, I would have that prototype out there, and it would be on the way to changing the world." He also hopes to spur the development of "cleaner energy resources that are going to really make a difference and are not based on giving the bureaucracy more power over our lives." "If we get a new approach to batteries, then finally solar panels then make sense. Right now, because it's ideologically driven rather than technologically driven, those people [who] are pushing us into that before we have the battery are evaporating enormous amounts of wealth. ... For example, if you ever want to have solar power on your house, you'll be able to collect enough energy and store it, so that all night long, you'll have enough energy to do everything." Although his competitor is running against him on environmental issues, Rohrabacher doesn't see himself as vulnerable on that front. "Here's a guy who spent his time on high-density development and basically destroyed the quality of life for little guys in order to get big guys a lot of money," he said of Rouda. "I think that he has no experience in these things, and I think he only knows enough to believe what he's told. ... He will be happy to just toe the line of whatever the people in the Democratic Party want him to toe when it comes to science." A poll released Thursday by the Los Angeles Times found that Rohrabacher and Rouda are neck-and-neck, with 48 percent each. But the California Republican is confident that he'll win at the ballot box next month. "There are some things that I really want to get done. I'm not in Congress to be in Congress — I've had enough of that already. I think that as chairman of the Science Committee, there are some things that ... I could accomplish that would be worth me going through all of this."